If you are still using an “old school” thermostat in your home, this might be the winter you make the leap to a new Smart Thermostat. The new thermostats are called “smart” for a reason. They can help you save money by studying factors like your energy usage, outdoor weather conditions, indoor humidity, and even whether you are at home or not. Then they adjust your indoor environment accordingly to maximize efficiency. Of course, if you feel chilly you can always override the automatic settings to adjust the temperature. Still, a smart thermostat can make a significant difference in the amount of energy you use to heat and cool your home. And that translates into some pretty cool savings. Heat and cooling settings be scheduled around your work/home pattern. The Wi-Fi version can be adjusted securely from virtually anywhere there is a smart phone or computer and Internet access. You can turn the heat up on your way home from work, or cool things off as you drive home from the beach! A warning is sent to your phone when an extreme shift in temperature is detected beyond normal ranges, which may indicate a heating system failure in your absence. Automatically lets you know when to replace heating and cooling system air filters. 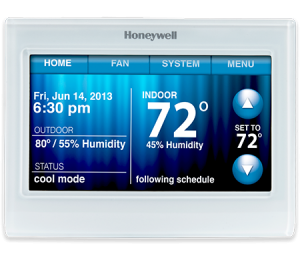 Comes with a 5-year Honeywell warranty (Nest® only offers coverage for 2 years). Some manufacturers claim that Smart Thermostats can easily be installed by the homeowner. But, unless you are a licensed electrician, it is better to have your thermostat professionally installed, as an additional wire is necessary to link the thermostat and your heating system. When programming preferences, be careful that you do not set your “low” temperature preference at too cold a temperature. When temperatures get truly frigid you should set the lower end of the temperature spectrum no more than 5°F below your desired comfort level. For example, if you like your home to be at 70°F, don’t allow it to fall below 65°F during sub-freezing weather. Otherwise the heating system has to work too hard to make up the difference, which can allow pipes to freeze. In all cases, we recommend a lower limit of 60°F during the winter months. A Smart Thermostat may seem like a luxury, until you realize how much easier it makes your life, and how much money you can save by avoiding heating and cooling an empty home. Ready to join the 21st century with a smart thermostat? Call Alvin Hollis at (781) 335-2100.